Despite blatant provocation, Russia must continue toward the finish line. 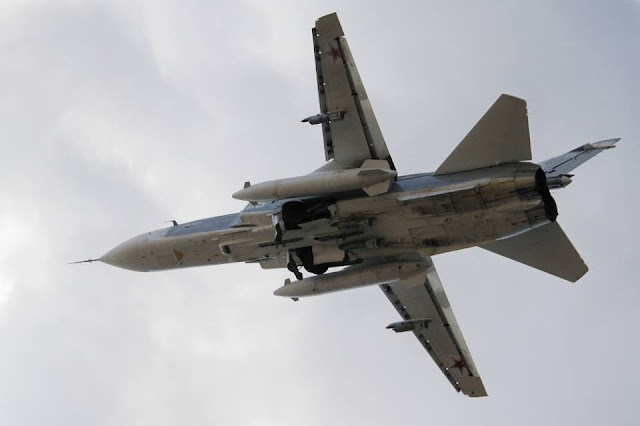 Turkish fighter jets on patrol near the Syrian border shot down a Russian warplane on Tuesday after it violated Turkey’s airspace, a long-feared escalation that could further strain relations between Russia and the West. The escalation is "long feared" not because the Turkish government actually fears that Russian warplanes crossing their border pose a threat to it or its people, but because Russia has ended NATO's proxy war, a proxy war spearheaded in part by Turkey itself, amid Russia's joint military operations with Syria against the self-proclaimed "Islamic State" (ISIS) and supporting terrorist factions. In addition to having a camera rolling as the plane went down in flames, terrorists operating in region had allegedly surrounded the dead pilot shortly after the incident according to Reuters. While Turkey maintains that it was only reacting in self-defense - it was against a nation's planes that it knew had no intention of attacking its territory - and what looks like instead was Turkey targeting planes operating along reoccurring routes and shooting one down once the pieces were in place to maximize the event politically. For Russia's part, it claims its plane had not even entered Turkish territory which would reveal Turkey's actions as an outright act of war. In recent weeks with Russian air support, Syrian troops have retaken large swaths of territory from ISIS, Al Qaeda, and other terrorist fighters. The Syrian Arab Army (SAA) has even begun approaching the Euphrates River east of Aleppo, which would effectively cut off ISIS from its supply lines leading out of Turkish territory. From there, Syrian troops would move north, into the very "safe zone" the US and its Turkish partners have long-sought but have so far failed to establish within Syria's borders. This "safe zone" includes a region of northern Syrian stretching from Jarabulus near the west bank of the Euphrates to Afrin and Ad Dana approximately 90-100 kilometers west. Once Syrian troops retake this territory, the prospect of the West ever making an incursion into Syria, holding territory, or compromising Syria's territorial integrity would be lost forever. Western ambitions toward regime change in Damascus would be indefinitely suspended. The endgame is at hand, and only the most desperate measures can hope to prevent Russia and Syria from finally securing Syria's borders. Turkey's provocation is just such a measure. Russia's time, place, and method of retaliating against Turkey is something only the Kremlin will know. But Russia's actions upon the international stage have been so far thoroughly thought out, allowing Moscow to outmaneuver the West at every juncture and in the wake of every Western provocation. For Turkey's government - one that has been consistent only in its constant failure regarding its proxy war against its neighbor Syria, who has been caught planning false flag provocations to trigger wider and more direct war in Syria, and whose government is now exposed and widely known to be directly feeding, not fighting ISIS - the prospect of Russian retaliation against it, either directly or indirectly, and in whatever form will leave it increasingly isolated. Until then, Russia's best bet is to simply continue winning the war. Taking the Jarabulus-Afrin corridor and fortifying it against NATO incursions while cutting off ISIS and other terrorist factions deeper within Syria would be perhaps the worst of all possible retaliations. With Syria secured, an alternative arc of influence will exist within the Middle East, one that will inevitably work against Saudi and other Persian Gulf regimes' efforts in Yemen, and in a wider sense, begin the irreversible eviction of Western hegemony from the region. As in the game of chess, a player often seeks to provoke their opponent into a series of moves. The more emotional their opponent becomes, the easier it is to control the game as it unfolds. Likewise in geopolitics and war, emotions can get one killed, or, be channeled by reason and superior strategic thinking into a plan that satisfies short-term requirements but serves long-term objectives. Russia has proven time and time again that it is capable of striking this balance and now, more than ever, it must prove so again.